A rich and creamy dish with a gentle chilli kick, it works well with the crispy baked Italian meats to give a wonderful added crunch. 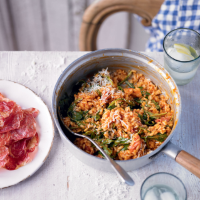 Try using other Sacla’ pastes to give a rich risotto without the spicy heat. 1. Preheat the oven to 200°C, gas mark 6. Place half the meat on a baking tray and bake for 5 minutes until crispy, then set aside. 2. Meanwhile, heat the oil in a frying pan, and fry the onion and garlic for 3 minutes. Add the rice and cook for 1 minute. Add the wine until it has nearly all been absorbed. Stir in the tomato and chilli paste and a little stock, cover and cook gently for about 20 minutes, gradually adding the rest of the stock until it’s all been absorbed and the rice is tender. Add more water if required. 3. Tear up the remaining meat and add to the rice with the rocket and Parmigiano Reggiano, and cook until the rocket has wilted. Serve with the crispy meat broken on top. This recipe was first published in Tue Aug 11 14:05:00 BST 2015.